Recently I was invited to give a talk about my journey into the mountains and my quest to climb amongst the world’s highest peaks. But what was the message I wanted to give was a question I asked myself. After all, not everyone wants to climb mountains, but we all have our “own” Mt Everest that we want to scale. Thank you for the opportunity to speak to you about my rather audacious plan to climb the world’s highest mountains. To climb as many of the world’s 8,000 metre peaks as I can. Heaven forbid to climb to the top of Mt Everest. Of course, standing on top of Mt Everest is an aspiration, not a goal in its own right, but part of a journey I have embarked on. My reason is no simpler, or more complicated than wanting to see what I am capable of, what I can achieve, to explore new horizons, to develop as a person and to grow in the face of difficulty. If there is one thing I have discovered since embarking on this journey of discovery is the need to be brutally honest as you come face to face with yourself. It is a place where your ego is best left at the bottom of the mountain and you must be true to yourself at all times. Of course, you don’t need to head to the mountains to practice that attribute. And I’ll talk more about the mountains later. I have themed today’s discussion around the notion that that there is no such thing as failure. Failure is a word I’ve never been comfortable with and I’m sure it doesn’t sit well with others. But for many, not achieving a goal they’ve set out to achieve often leads to despair, feelings of not succeeding. Life is a learning experience, a journey that we are all on and we should never consider anything we do as a failure. Maybe there are times we wish that we might have done something differently and there is nothing wrong with that. But we should all think of our experiences as the building blocks that create the mosaic of who we are. A review of most dictionaries will give a number of definitions of failure, but the common theme is “the condition or fact of not achieving the desired end or ends”. Now I understand that many of you are students and are looking at me and thinking that when I do a test I will either obtain a pass mark or a fail mark. So how could you say there is no such thing as failure. My answer to you is it is the way in which we interpret the signal that the mark or result is giving us. An exam result tells us the level of understanding we have, a high mark might indicate a greater level of understanding and a lower mark that more work on the topic is required. Importantly, it gives us feedback that we can move forward with and if it signals a need for greater understanding on the subject than the exam result has been successful in conveying that to us. That doesn’t sound like failure to me? Mind you during my school days I received plenty of feedback that more learning was indeed needed. But let me tell you a bit more about my journey into the mountains. I have always had a keen interest in hiking and camping and have spent many nights out under the stars in the Australian bush, in the outback. Shared in the company of friends, or alone at other times. There is something quite satisfying about walking across open plains, over hills, to sit down by a campfire at the end of the day to reflect on the journey. And yes, I am a daydreamer, so I spend plenty of time reflecting, dreaming on what I would like to do, what path I would like my life to take. In fact I often play role games with myself, picturing myself doing the exact thing I desire to do. As a young and new entrant to the Bank of New South Wales, I recall reading an article in “The Etruscan” a publication the bank produced for its staff that talked about money market traders in the bank’s head office.. It was 1975 and the money market operations would have been significantly different to those in operation today. I must have only been about five-years old at the time, surely? It sounded exciting even if I didn’t quite understand what they really did. But I played out that role of money market dealer many times in my dreams, in my mind’s eye. I wanted to do this, to be one of these people, whoever “these” people were. Today I sit in the bank’s Sydney financial markets dealing room transacting billions of dollars of foreign exchange, money market and commodity transactions weekly for the bank. The seeds were sown in my mind’s eye. The power of the mind is not fully understood and I’m no expert on the subject, but I came to the realisation a long time ago that your mind can be fooled into believing anything. In fact, it doesn’t seem to know what is real or what is not real. Seemingly, it just accepts what we tell it as truth. The importance of positive reinforcement in our mind is clear to me and the reason I never use the “F” word. Have I seen myself standing on top of Mt Everest? You bet I have, but of course there is still a lot of work I need to do before I make an attempt on the summit of the world’s highest mountain. But many times I have seen myself waving to the folks at home from the top of the world. Returning to the safety of loved ones and friends. A couple of years ago someone casually mentioned to me that they were surprised I hadn’t climbed Mt Everest. At the time I was rather taken by this comment. Sure I love the outdoors and keep very active and fit – and I must confess to having thought about Mt Everest in passing at different times. And I have been an avid reader of books about those who had tried and succeeded. I pondered on this quietly for a long time not even sharing my thoughts with close family. Eventually I realised the seed that had been planted was already flourishing in the fertile soils of an adventurous spirit. I wanted to experience the feeling of standing on top of a mountain that I had climbed. But not any mountain, the world’s highest mountains. And what a great opportunity this would present to learn new skills and to test my boundaries, to see what I was truly capable of. Of course it would also give me a reason to keep training and to be fit. I am constantly working on my fitness and ultimately you can probably never be fit enough to climb at high altitude, in the death-zone above 7,000 metres. Most days I train in the pre-dawn hours up in my Shed which is full of various weight lifting and exercise equipment. And on weekends, kayaking on Narrabeen Lake on Sydney’s northern beaches, or climbing and hiking in the mountains. But it isn’t just about physical training. You can practice by reinforcing it with positives each and every day. By picturing yourself achieving and guarding against negative thoughts and self-doubt. I am focussing on the technical skills of mountaineering that I need to master. Rope handling skills, tying knots, learning to walk across snow and ice in crampons. It has been like learning to walk all over again. These are all new skills to be learnt, that I am learning. And for someone who grew up in tropical North Queensland and played in the jungles of Papua New Guinea, my exposure to snow and ice up until recent times has been limited to a European holiday many years ago. I am fortunate to have a very supportive partner, Janet, and son, TomO, who have both chorused they’re support loudly. And when it comes to the mountains and high altitude climbing, we have discussed the risks associated with it, but never to the point of dwelling on it. We understand the risks and Janet simply said get the best training that money will buy, apply what you learn, be safe and remember to leave always your ego at the base of the mountain. And Janet frequently reminds me that getting to the top of the mountain is optional, knowing how to get back down safely is mandatory. I’m sure you will agree that is sound advice indeed. Thankfully I am being tutored by the great team at the Australian School of Mountaineering in Katoomba, and Guy Cotter and his team from Adventure Consultants in New Zealand. The task has seemed overwhelming at times, especially for someone that has trouble tying his shoe-laces. Yes, I have trouble tying my shoelaces, although with Tomo’s expert guidance I have made great inroads into mastering this task in recent times. A sound accomplishment in an environment where successfully tying the appropriate knot is a good skill to have. At least you would think so, wouldn’t you? I have found a love of climbing in the Blue Mountains and whilst there is always a serious side to scaling rock walls and cliffs, we have managed to have many laughs along the way. I can recall a very nervous laugh from one of my climbing partners, an instructor from the Australia School of Mountaineering, when I casually mentioned that I could not tie my shoe laces. That was after I had just tied a safety rope that he was attached to. I did see him checking that knot soon after. And who would blame him for that I would have if I was him. And at the end of each climb we have sat back and reflected on what went well and what could be improved on. But even on less successful days the “F” word has never used because it is a learning experience and on each of my forays into the Bluey’s we have identified plenty of things that I can improve on. 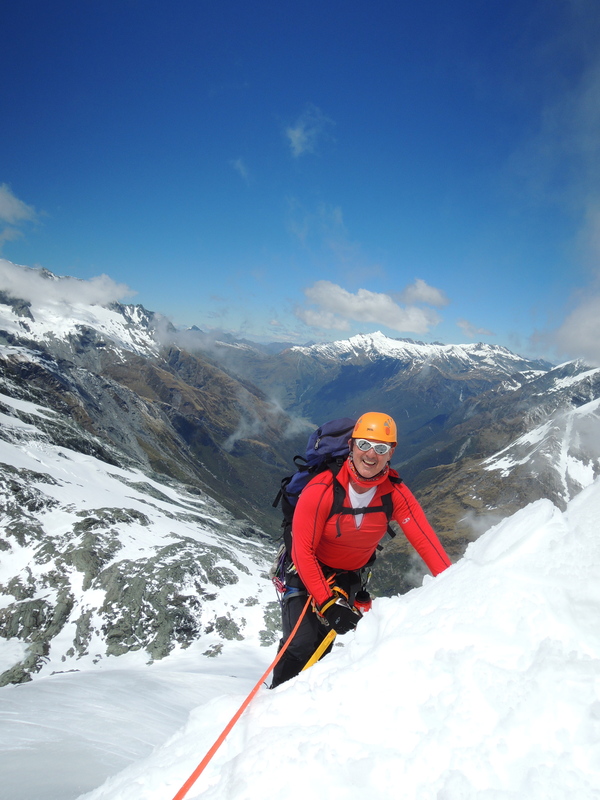 In January this year I travelled to New Zealand’s South Island to further my experience and to climb Mt Aspiring. Mt Aspiring, the Matterhorn of the South as it is often referred to as, stands at just over 3,000 metres and is a very impressive and majestic mountain. This was a follow up to some training I did on the Fox Glacier in New Zealand perfecting my ice and snow skills last September, but I still needed some revision work prior to our ascent of Aspiring. Unfortunately the weather was conspiring against us and we had little preparation time. Arriving at Colin Todd Hut high on the Bonar Glacier we needed to make our attempt the very next morning as the weather was forecast to deteriorate as the week progressed, making an attempt less likely as time passed by. In some ways I was pleased that I had little time to think about the climb, but I was anxious that it was going to happen the very next day. We headed off around 4am in the morning under clear skies and whilst progress was slow we were advancing towards our objective. As we climbed to around the half-way point and having passed through some of the more difficult sections, the weather took a turn for the worse, the wind started to blow a gale over the summit and it would be impossible to continue safely. We were exposed to sleet, strong winds and rain as we descended, necessitating quick and efficient application of the skills I had been learning. This was the real deal…and efficient use of time to minimise our exposure was paramount. Now was not the time to be fumbling around with ropes in the cold on the side of a mountain. Eventually we returned to the hut, tired after about 8 hours of mountaineering. Over a warm cup of tea we were able to reflect on the climb. Of course the objective was to summit, to climb to the top. It would have been all too easy to think that we had failed in our objective. But this was anything but a failure, the lessons learned on the mountain were invaluable. Lessons of judgement, skills and confidence. In fact, I feel I gained more from not making it to the summit that day and whilst you wouldn’t always want that as an outcome – this was no failure. The lessons learned on Mt Aspiring will assist me greatly as I have joined an expedition to climb in Nepal later this year. In November I will be heading to Kathmandu and into the Himalaya’s to climb three 6,000 metre high peaks. Loubche East, Island Peak and Pokalde. These mountains range in height from 5,800 to 6,200 metres and at those heights another complexity will be added. The available oxygen declines as we go higher in altitude making tasks that would be simple and easy at sea level much more difficult in the rarefied air. This is the post-monsoon season in the Himalaya’s and temperatures will also be quite cold, especially at altitude. 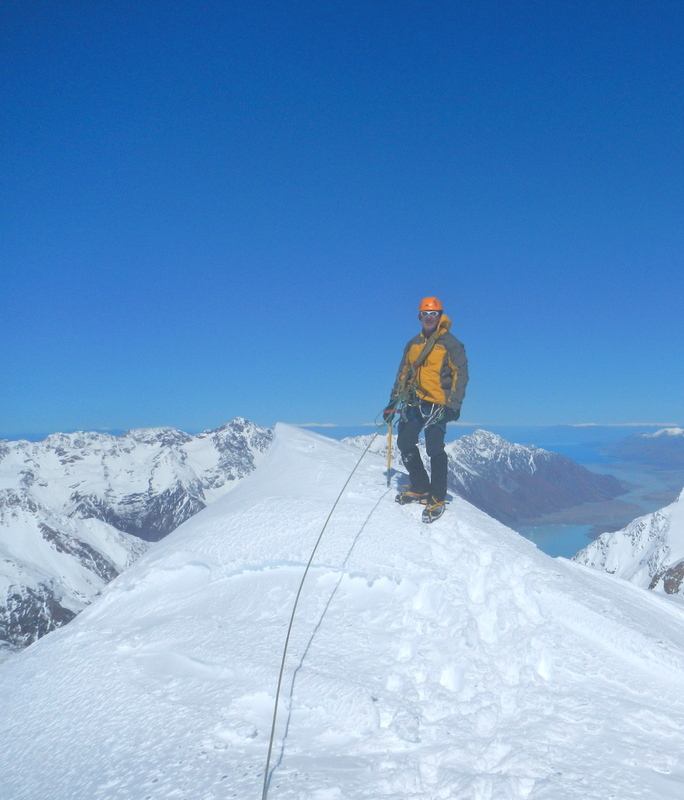 The expedition will provide me with a great introduction to climbing at higher altitudes and will hopefully provide the much needed experience to climb my first 8,000 metre peak, Cho Oyu in Tibet, in 2014. Of course, it will also be an opportunity to take in the stunning views of the world’s highest mountains. And Janet and TomO will travel to Nepal at the end of the expedition so we can experience the culture and warmth of the Nepalese people together. Something we are all looking forward to. It is important to us that we share the experience together as a family and whilst neither will climb the mountains with me, they both show tremendous courage as all whom wait for news from the mountains does. Although TomO has already declared that one day he hopes we will stand together, arm-in-arm, on top of Mt Everest. We are committed to bringing him up in an environment that encourages him to believe he can achieve anything he wants to, whatever that might be. To understand that the possibilities will only be limited by his own imagination, his own insecurities. Lead by example has always been our motto and what greater feedback could you receive than your son telling you he is ready and willing to take on the world and believing he can! I think it is important to never lose sight of the fact that all journeys can only be made one step at a time and that each and every one of those steps is a learning opportunity for us all. Use each of these steps, these moments, to reinforce the positive aspects of learning and reject anything negative. And as you make your journey through this year, through life, accept everything as a learning experience. Never use the “F” word. I meant to comment here the other day, Baz, and got sidetracked. I think that with a speech like this you have inspired all kinds of kids to push forward in their lives and reach for their dreams. What a great message! And you know, it helps me in many ways to talk about it! What a terrific message! I have missed quite a few posts, haven’t I? Time to get caught up! I need to get out on some adventures as I need something to write about! If we could learn to leave our egos at home as we begin each day, how much better a place would the world be? AND, if we all approached not reaching goals as opportunities for learning how much better would each of be as person? I’m sure your audience enjoyed your presentation! Beautiful photos! I keep finding new reasons to want to go to New Zealand, and you’ve provided yet another. I thought the North Cascades were the world’s most beautiful mountains, but you seem to have their twin range. It is a spectacular country…! Bravo! Bravo! Bravo! Well said Baz..!!! I will not be apologising for my frequent use of the ‘F’ words here….What a Feracious speech, which Festinated my senses with such Fulgour. “FAIRLEAD” … I think sums you up….you are the ring through which rope is led to change it’s direction without Friction!!! You have already achieved this…just by sharing…!!!! Oh don’t worry, it has been a week of “learning” for me to! And all too frequently the negative experiences one has early in life can have a profound impact later. Thank you for the vote of confidence!